KT-1 is an Ethernet-ready single door controller, supporting two readers – IN/OUT. With its elegant design and innovative single button enrollment, KT-1 offers the ultimate experience in access control installation. KT-1 is based on the existing, highly proven KT-400 controller firmware and can be connected directly to DSC PowerSeries or other alarm panels for intrusion integration. Combine the new KT-1 controller with EntraPass security management software (v6.02 and higher), as well as EntraPass Web and the EntraPass Go mobile app to create a highly scalable solution that installs quickly, can be managed remotely and provides a superior user experience. KT-1 is ideal for small applications, but is equally suited to IP centric buildings and large systems with remote sites. The KT-300 door controller supports up to two readers, which can be installed either on a single door (to monitor both entry and exit) or on two separate doors. It provides connections for all peripheral devices necessary for a complete access control system and can be linked with other door controllers to provide control over millions of doors. Stand-alone mode protects against power or system failures and the system stores cardholder and event data, which is automatically transmitted back to the EntraPass system once the network connection is restored. Flash memory allows for firmware updates from an EntraPass workstation in just a few minutes. Built-in Combus expansion means that relay, input, and output modules can be added to connect HVAC systems, elevators, motion detectors, and more. The Combus is a communication protocol that is integral to the KT-300. It uses a four-conductor cable bus to which several expansion modules can be connected. 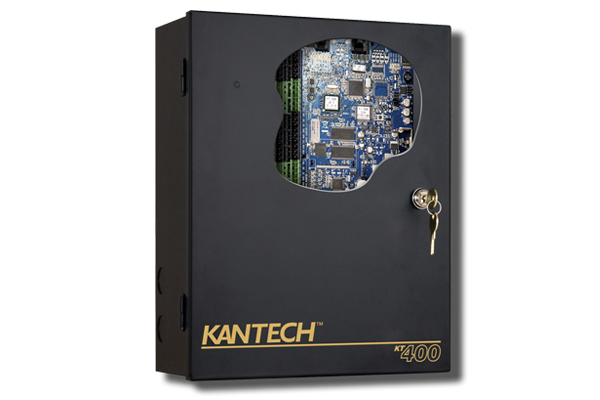 KT-400 is an Ethernet-ready four-door controller that provides 128-bit AES encrypted communication with the EntraPass system and is a highly secure solution for any security-conscious business. 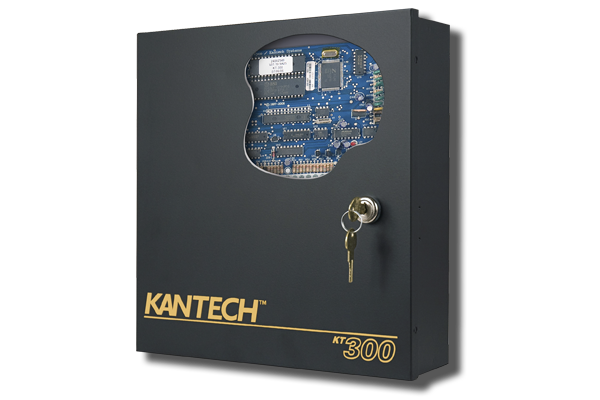 KT-400 can easily be integrated into an existing EntraPass system with other Kantech controllers (KT-100 and KT-300) or can provide the foundation for a brand new security installation. With an onboard Ethernet port, an external IP device is no longer required to connect to the network. The onboard port is dual-sensing, which means the system senses whether the connection is 10Base-T or 100Base-T, and adjusts automatically for faster connectivity. KT-400 manages network polling and communicates with the EntraPass Gateway only when an event has occurred. Communication integrity is ensured through a heartbeat signal which is sent at regular intervals to the EntraPass system. This asynchronous communication significantly reduces the amount of bandwidth required to manage the access control system over the network. For more information and news, please visit the Kantech website.